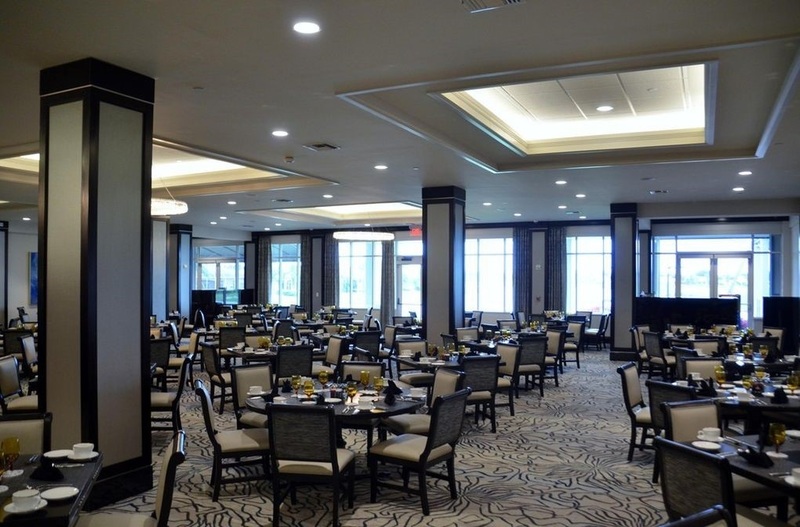 Aberdeen Golf & Country Club is proud to offer all members and their guests the full use of the 40,000 square-foot Clubhouse and the 23,000 square-foot Aquatic and Fitness Center. Both elegant and casual dining options are available in each building. The Menu Planner contains helpful information for anyone who wants to plan their dining experience at Aberdeen in advance. It is issued monthly and displays the nights the club is hosting evening dining and the price of each menu item. This includes Panache Casual Dinner, Panache Sunday Night Buffet, Oasis Tropical Bistro Night and the SSL TAPAS Night. It also displays a helpful list of the upcoming Social Events for that month. The Panache, located in the clubhouse, is the largest dining venue in Aberdeen. It offers lunch, Sunday brunch, evening dinners and many events for specific holidays and special functions. Reservations are not taken for lunch, but they are required for dinner. The Oasis Café is located in the Fitness Center. With its beautiful décor, it provides an intimate dining venue with exquisite food offerings, cocktails, and an outside veranda that provides an exceptional view. The Oasis Café offers a distinctive menu different from other Club dining areas. Lunches and Tropical Bistro Dinners are usually offered on the weekends. Reservations are not taken for lunch, but they are required for dinner. The Sunset Lounge (SSL) is located in the main clubhouse near the Panache. On select evenings the Sunset Lounge offers TAPAS night, an excellent small plate menu in a more relaxed informal setting as well as a fully-stocked Lounge Bar of wine, sprits and beer. Social evenings with light complimentary hors d'oeuvres also take place in this area. The new outside seating area is a relaxed atmosphere to enjoy cocktails and food with friends while overlooking the Golf Course and Bocce courts. On select TAPAS nights the SSL offers live entertainment in the outside seating area.